Brer Dane Designs is now Pagliacci Designs. 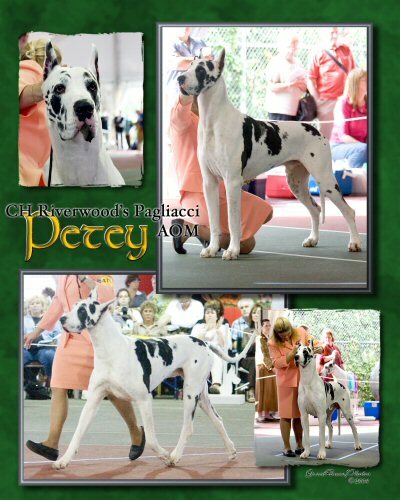 I changed the name to honor our first show dane, Petey - BISS CH Riverwood's Pagliacci. The name Brer Dane came about because my husband's childhood hero was Brer Rabbit. Since we have Great Danes, hence Brer Dane. My husband, Rob King was in construction but due to a brain tumor is on disability. We’re coming up on our 32nd anniversary. I am Debbie King and we both grew up in Miami, Florida. At present we live in the Huntsville, Alabama area. Both of us have always loved animals and originally I was a small dog fan. However, Rob convinced me our first dog should be a larger dog. Rob was going overseas to work for a while and he wanted to make sure I had a companion and protector while he was gone. We rescued our first dog from the pound and he was a Great Dane/Weim mix. Rhett used to play with a fawn Great Dane down the street from where we lived in Huntsville, Alabama. Needless to say I was hooked on Great Danes very quickly. We got our first pure bred Great Dane in 1993. A mantle Great Dane that was bribe number one to get me to move back to Florida. We named him Ritz and he was with us for far too short a time. We lost Ritz just before Christmas of 1999 due to a heart problem. The house seemed very empty without a Great Dane so I started searching for a puppy. The harlequin lines that first took my breath away were Riverwood and BMW lines. One of the two Great Danes that I fell in love with when researching harlequin pedigrees was BISS CH Riverwood's Rondo. So of course I called Eva Robinson of Riverwood Ranch Harlequin Great Danes. She referred me to the owner of a litter that was recently born. The rest is history, we fell madly in love with the harlequin male in the litter. Eva Robinson very graciously let us use her Riverwood kennel name for Petey and I will be forever grateful to her for this. Petey is our show marked Harlequin Great Dane. Petey is first and foremost our beloved pet. Petey finished 21 (490 breed points missing by 7 points) in breed standings and 16 in group standings (670 group points) for 2005 with VERY little advertising. For more information about Petey, please go to Petey's Place or see his pedigree. You can see pictures of Petey on the Fun Stuff page. See Petey at 6.5 years old moving around the ring like a youngster. Video courtesy of Chuck. Warning file takes a while to load! I got the cutest Pagliacci Great Dane Doll for my birthday!. The pictures really don’t do him justice. Click here to see pictures. Unfortunately we lost Petey a few months short of his 11th birthday. He made the journey to the rainbow bridge on August 9, 2011. We miss him dearly. We looked for over a year and a half for a mantle girl. Then along came this spotted little girl and I just knew she was the one and there was a reason why I hadn’t found the mantle I’d been looking for. If you’d like to know more about Ariel, please go to Ariel’s page or see her pedigree. We got our mantle when we least expected it. What can I say this boy has a serious case of bedroom eyes! Dennis is a showable mantle who we think has gotten the best of both parents. For more information about Dennis, please go to Dennis’ page or see his pedigree. Cricket is a snuggler extaordinaaire...which is in the genes. As Grandpa and Daddy are both big time snugglers and lap dogs. Cricket can't hold her licker either and is constantly giving kisses! She loves to hang out with Grandpa Petey and snuggle. Her Daddy Dennis is her constant playmate and wrestle mania partner. Copyright© 2004-2013 Brer Dane and Pagliacci Designs, all rights reserved. Site designed and maintained by Pagliacci Designs.